Judy Katz-Levine has a new book out, The Everything Saint, available from Amazon and published by WordTech Communications. Her other books include Ocarina and When The Arms Of Our Dreams Embrace. A chapbook, When Performers Swim, The Dice Are Cast, emphasizes her work in jazz. Poems and translations have appeared recently in Salamander, Blue Unicorn, Ibbetson Street, Miriam's Well, Writing In A Woman's Voice, and Peacock Journal Anthology. 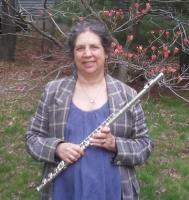 Also a jazz flutist, she enjoys playing jam sessions in the Boston area. "Driving to the MLK synagogue service" and "August Heat and Chinese Chives"
"You can tell me anything"
"Without an Answer" and "Journal and Sky"
cup of coffee at the cafe. "Where there are fields of mint, but we remember," "I will hold a glass of water in my heart and pray," and "A ghazal with hidden questions and a flame"
"For a protector" and "A Hand that Bandages the Living"
Because illness was honing in like a scraggly coyote. We became still, one within the other folded like leaf within leaf. ​chanted in quiet devotion as the first star laughed over the dogwood. My brother came, and, again,my mother, and the nurse remarked on what a wonderful family I had, warm, as the kids with drug problems played chess in the open waiting room, and an adolescent with long black hair and earrings in her nose drew intricate pen and ink sketches.